ASC’s are now confronted with more frequent and more comprehensive surveys than ever before. 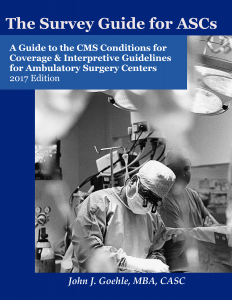 Understanding the Conditions for Coverage for an ASC as well as how they are interpreted by CMS is critical for ASC leaders. As an ASC Leader, you must continuously make sure your ASC is ready for a Survey at any time. 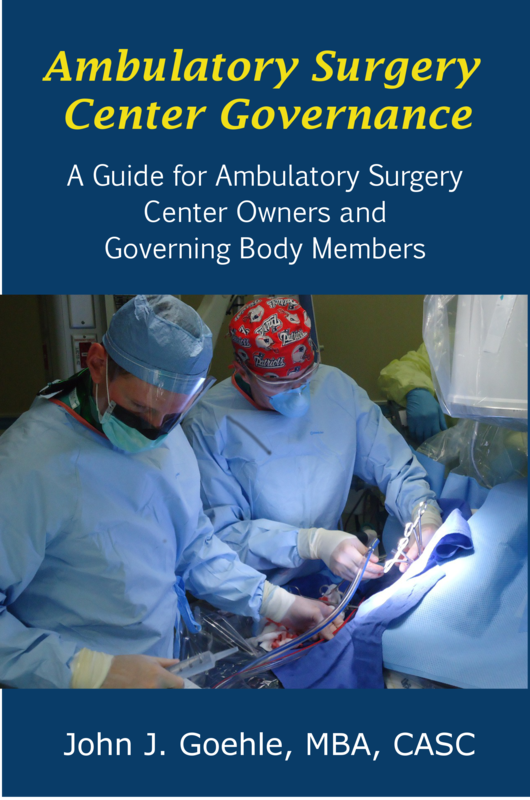 Ambulatory Surgery Centers are subjected to a wide range of regulatory and accreditation requirements. Keeping current with these requirements is not easy. This is where Ambulatory Healthcare Strategies can help!. Tracking of the required Governing Body responsibilities (CMS and Accrediting Body) and preparation of an annual plan to review and act on all of those responsibilities. Assistance with or preparation of agendas and minutes for the Governing Body. Attendance at Governing Body and/or other committees by phone, teleconferencing or in person if requested. Preparation of annual goals and objectives for the organization (as required) and assistance in preparing a plan to carry out those goals and objectives. Work with administration to maintain the policy and procedure manual as required by state and federal regulations and perform an annual comprehensive review of the manual. Annually, perform an on-site “mock” survey to assess the readiness for an accreditation survey. Based on the results of the survey, AHS will work with the administration to prepare annual goals and objectives related to regulatory and accreditation compliance. Assistance with any State, Federal or Accreditation Surveys, attendance (by phone or in person as practical) at the survey and/or exit conference, review and preparation of a response to any survey findings (eg. Notice of Deficiencies), and assistance in implementing the plan of correction. On-going email and telephone support for the administration and members of the governing body in the areas of ASC Administration, Regulation and Accreditation. Access to the Surgery Center Academy for orientation and annual mandatory training of staff and special training for administration. Call John Goehle today at 585-594-1167 for a no-risk, no pressure consultation. 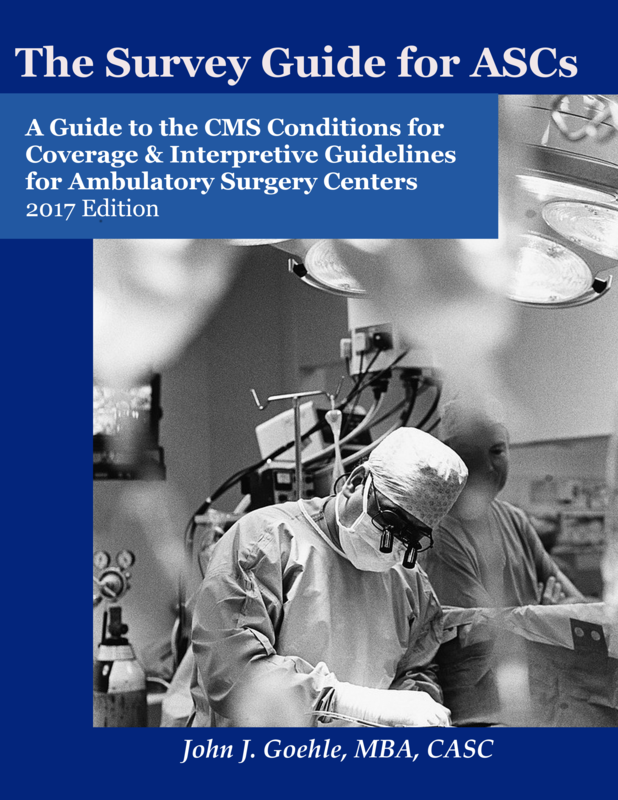 Purchase the ASC Industry's Most Comprehensive Summary of the Regulations and Interpretive Guidelines. 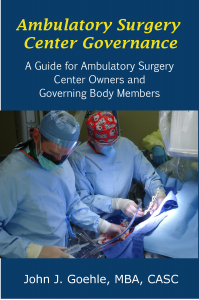 Purchase Ambulatory Surgery Center Governance - A Guide for Ambulatory Surgery Center Owners and Governing Body Members.